The most common metrics for resolution analysis in medical imaging are valid only for (approximately) linear systems. While analogues to these metrics have been used in attempts to describe resolution performance in nonlinear systems, the analysis is incomplete since distortion effects are often ignored. In order to investigate these effects, I developed a methodology to independently analyze the amplitude modulation and waveform distortion properties of nonlinear systems with specific application to medical image processing algorithms. The method uses sinusoidal basis functions from which two metrics were derived to distinguish amplitude modulation from nonlinear waveform distortion: principle frequency response (PFR) and distortion power spectrum (DPS), respectively. Additionally, two figures of merit were developed to describe the relative impact of nonlinear distortion as a result of image processing: distortion index (DI) and ΣDI. 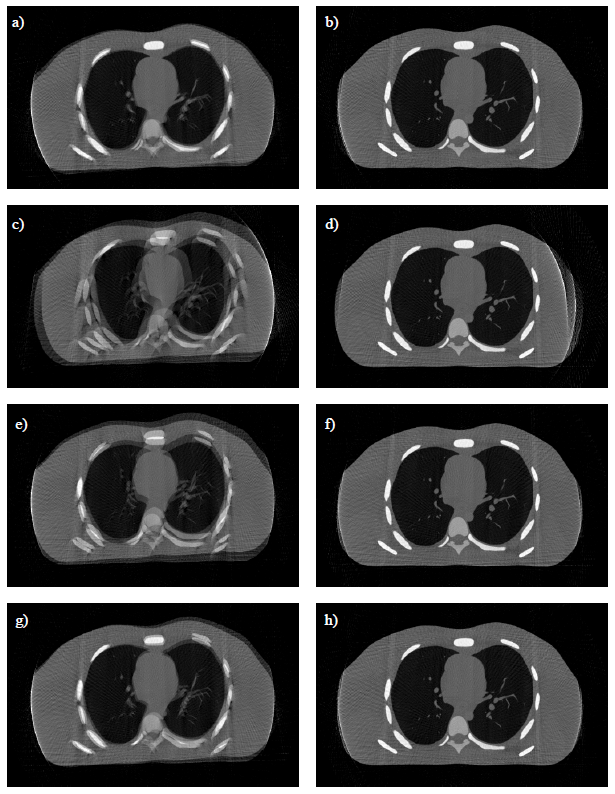 So far, the performance of these metrics has been demonstrated using three popular nonlinear algorithms (median, bilateral, and wavelet filters) in three unique imaging contexts relevant to medical imaging (FIG. 1). FIG. 1. Image backgrounds for nonlinear resolution analysis. (a) Simulated white (uncorrelated) noise. (b) Gaussian-correlated white noise. (c) Lung ROI from an anthropomorphic phantom image acquired with an indirect-detection flat panel detector. FIG. 2. The original sinusoid (averaged result obtained at CNR = 1) has horizontal and vertical frequencies u0=0.3438 and v0=0.1250 pixels-1, respectively. The contrast of the principle frequency component in each result as a fraction of the original amplitude is indicated by the respective PFR(u0,v0) values (indicated from left to right, top to bottom): 0.0350, 0.0373, 0.0046, 0.2843, 0.2196, 0.1949, 0.1225, 0.1222, and 0.1222. DI(u0,v0) values indicate the fraction of output signal power attributed to distortion: 0.8418, 0.8120, 0.9936, 0.0052, 0.0020, 0.0007, 0.4545, 0.4558, and 0.4558. All images are equally scaled. FIG. 3. ΣDI(CNR), a summary measure of nonlinear algorithm resolution performance, is plotted for various background images showing clear differences in the overall impact of algorithm nonlinearity as it affects resolution performance. ΣDI(CNR) indicates the fraction of total output signal power attributed to nonlinear waveform distortion averaged over all spatial frequencies. The results of this work have revealed that image context [signal contrast-to-noise ratio (CNR), image background, etc.] and nonlinear mechanism both impact the shape and magnitude of the resolution and distortion response functions (FIGS. 2-3). Furthermore, nonlinear processing may fundamentally change the information content of medical images through the modulation of signal power at non-principle frequency components. Just as object contrast, noise magnitude, noise correlation, and background anatomical signal affect human observer performance, nonlinear algorithm resolution performance is likewise affected. This implies that the nonlinear resolution and distortion properties specific to particular imaging tasks are most accurately measured in the context in which they naturally appear. Therefore, the first- and higher-order resolution effects of medical image processing algorithms should be routinely assessed in a task-specific manner against natural (anatomical) backgrounds within CNR ranges expected in clinical practice, especially as nonlinear processes become more pervasive in medical imaging. The metrics developed through this work provide an avenue for assessing the resolution and distortion effects of nonlinear algorithms. Dedicated breast computed tomography (bCT) has been used to provide compression-free three-dimensional (3-D) images of the breast volume at doses comparable to compression mammography. (Boone et al., 2001) Recent work at the Carl E. Ravin Advanced Imaging Labs (Duke University, Durham, NC) has produced high-quality XCAT phantom models from segmented bCT data. (Li et al., 2008) My work improves the accuracy and realism of bCT tissue segmentation using automated methods which refine the detection of low-contrast fibroglandular structures to produce high-resolution realistic computer-generated XCAT breast phantoms from empirical human subject data (FIG. 4). FIG. 4. Sample segmentations. (a)-(d) Denoised and inhomogeneity-corrected coronal bCT images. (e)-(h) Corresponding segmentations with six segmentation classes and skin artifact correction. Note that the fine detail of the skin internal boundary has been preserved. (i)-(l) Corresponding skin mask segmentations. The results of this study are intended for publication in Medical Physics. Correlated-polarity noise reduction (CPNR) is a statistical image noise reduction technique. It achieves noise reduction by iteratively estimating the polarity (sign) of noise at a given pixel followed by subtraction of a random noise value from a distribution matching that of the image. The sign of the subtracted noise value is forced to have its sign match the original noise polarity estimate in the pixel of interest. Doing so reduces the noise standard deviation in an image by up to 20% per iteration (FIG. 5) with little negative impact on image resolution, few artifacts, and resultant image noise characteristics that appear "normal." Sample images are shown in FIG. 6. FIG. 5. Noise distributions showing iterative decrease in sample standard deviation with CPNR processing. 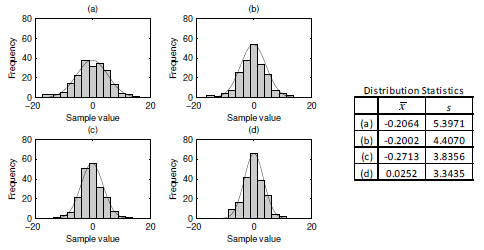 200 random samples were initially drawn from the normal distribution with a mean of 0 and standard deviation of 5.. Sample histograms are shown with normal distribution overlay. Note the excellent correspondence between sample histograms and normal distributions generated from the measured statistics in the table. (a) Original sample distribution. (b) Results after one iteration. (c) Results after two iterations. (d) Results after three iterations. FIG. 6. These images demonstrate the utility of CPNR as a dose-reduction tool. (a) ROI from a standard dose x-ray image of an anthropomorphic phantom obtained using standard clinical technique. (b) Image obtained at one-third standard dose with CPNR processing. Note how CPNR processing in (b) retruns an image of essentially equal image quality to (a) but at one-third the radiation dose. Providing adequate healthcare in resource-limited regions of the world is a difficult task. Part of this difficulty is due to economic constraints, and part is due to the lack of advanced medical infrastructure. A standard component of state-of-the-art medical care in developed parts of the world is volumetric imaging such as CT or MR. However, such scanners are typically not available in resource-limited regions. For example, in certain regions of sub-Saharan Africa, regional medical centers serving a population of up to one million people often have no CT or MR scanners. The lack of CT scanners limits the level of care that can be provided, and often makes it difficult to assess which patients would benefit from transfer to a larger medical center. Such transfers of patients are costly and burdensome to the families involved and yet it is difficult to make medical decisions on which patients to transfer because of inadequate imaging equipment. Lack of adequate imaging equipment also complicates the clinical management of patients with trauma, infection, hemorrhage, stroke, or malignancies. In short, the lack of CT scanners makes it difficult to provide a higher level of care at these intermediate-sized hospitals. It would be ideal if there were sufficient funding to provide CT or MR scanners to all such regions, but that is not currently realistic. Instead, we are evaluating the design of a lower-cost CT device that would be appropriate given the economic constraints in such regions. This CT scanner must cost a small fraction of what a traditional scanner would cost in order to be feasible. Our proposed CT scanner eliminates the rotating gantry, which is one of the most expensive components of a traditional CT machine, and instead rotates the patient. Cone-beam CT is then performed using a stationary digital flat-panel detector to reconstruct the tomographic images. While the cost of such a system is not inconsequential, it is nonetheless much less than a standard CT machine, and the device can also function as a conventional x-ray imaging facility when not being used for CT. Thus, the incremental cost of adding CT to this device is minimal. FIG. 7. This video shows series of simulated projection images using the XCAT phantom. It was used to simulate the effects of patient motion on CT image reconstruction. FIG. 8. Uncorrected and corrected reconstruction images from XCAT acquisitions containing motion. a) Uncorrected image from XCAT trial 1. b) Reconstruction of image a) with motion correction. c) Uncorrected image from XCAT trial 2. d) Reconstruction of image c) with motion correction. e) Uncorrected image from XCAT trial 3. f) Reconstruction of image e) with motion correction. g) Uncorrected image from XCAT trial 4. h) Reconstruction of image g) with motion correction. Wells, J. R. & Dobbins, J. T. III. A closed-form, analytical solution to 3-D motion correction in lower-cost CT.
Copper (Cu) has been an element of particular interest with respect to Alzheimer’s disease (AD) pathology. Cu ions bind with amyloid beta (Aβ) peptides causing the propagation of neuronal plaque formation in AD patients. The body produces Aβ to combat excessive extracellular cholesterol concentrations. Therefore, some connections may exist between dietary cholesterol, Cu uptake in the brain and AD pathology. This phenomenon provided the inspiration for a magnetic resonance imaging (MRI) examination of rabbits as models of human AD. Brain images of normal (FIG. 9) and diseased (FIG. 10) subject data were manually segmented from whole-head images and registered to a standard space for subsequent averaging. A comprehensive averaged dataset developed from all subjects served as the base model for a rabbit MRI brain atlas. Future prospects for the integration of this atlas into pre-existing segmentation algorithms was also examined. FIG. 9. Normal rabbit ventricle extractions overlaid in green on averaged normal dataset. Slices 14 through 31 are indicated here. Lateral ventricle measurements start on slice 18. The total ventricular volume represented here is 0.1609 cm3. FIG. 10. Diseased rabbit ventricle extractions overlaid in orange on averaged diseased dataset. Slices 14 through 31 are indicated here. Lateral ventricle measurements start on slice 18. The total ventricular volume represented here is 0.1988 cm3. Lemieux, S. K., Smith-Bell, C. A., Wells, J. R., Ezerioha, N. M., Carpenter, J. S., Sparks, D. L. & Schreurs, B. G. (2010). Neurovascular changes measured by time-of-flight MR angiography in cholesterol-fed rabbits with cortical amyloid beta-peptide accumulation. J Magn Reson Imaging 32(2): 306-314. Wells, J. R. (2008). Image Analysis: Building a rabbit MRI Brain Atlas. B.A. Honors Thesis. Central College, Pella, IA.